Yes, like the great Criswell, I can foresee the past and read your mind. The good news is…I’m back. And what brought me up out of a big pile of mothballs to resurface now? Commercialism. It’s Halloween tomorrow, and we all know what that means. Time to get on with Christmas! 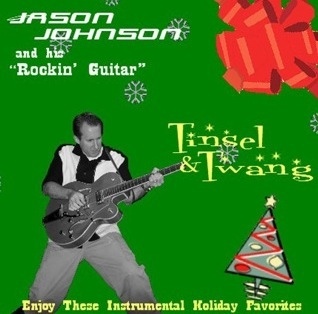 To that end, check out my EP, “Tinsel & Twang”. This collection of seven instrumental Christmas classics is yours to download at iTunes and Amazon MP3 for less than $7.00! I can’t believe it either! Get in the Christmas spirit early this year with some retro-styled tunes from yours truly. There’s something for everybody, here. It’s rock ‘n’ roll, surf, country, jazz and rockabilly all wrapped up in red and green like a great big present with your name on it under a pink aluminum Christmas tree. It’s your favorite seasonal songs smokin’ hot as a flaming yule log. It’s Tinsel meets Twang! Only 55 shopping days left until Christmas! If you’re in an extra-sarcastic Christmas mood, download my song “Christmas at Wendy’s” at iTunes. While you’re at it, buy two…make it a gift! Check back in again soon. I’ll try not to stay gone so long this next time!